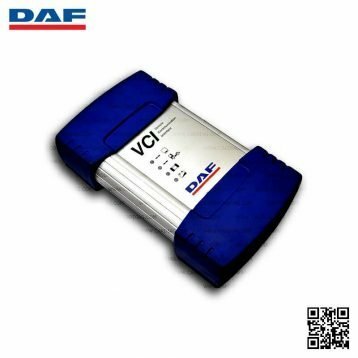 If you want to install this emulator on DAF LF trucks it is highly recommended (in some cases it is necessary) to erase all current and stored DTC (data trouble code) errors from truck ECU (can be done on any DAF workshop that has DAF VCI 560 diagnostic tool). AdBlue Emulator V4 NOx is compatible with DAF trucks of LF (Grundfos) and XF series. This is the installation manual for DAF LF (Grundfos) trucks – EURO 4, EURO 5 and EURO 5 EEV versions. 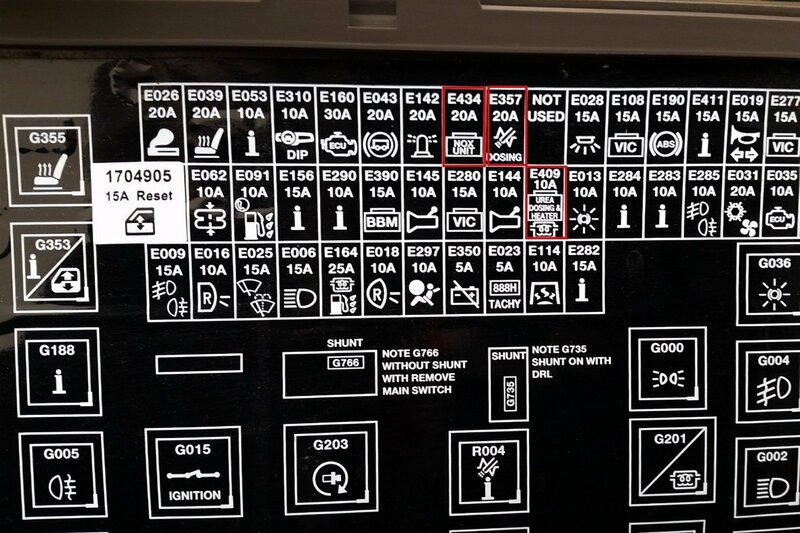 Before installing AdBlue Emulator V4 NOx on DAF LF (Grundfos) truck please make sure that you have emulator programmed to DAF LF (Grundfos) program. 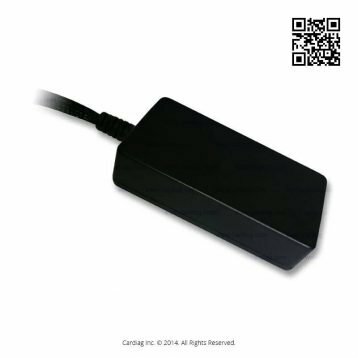 You can order pre-programmed emulator or you can purchase AdBlue Emulator V4 programmer designed for V4 type emulators and change the program yourself. 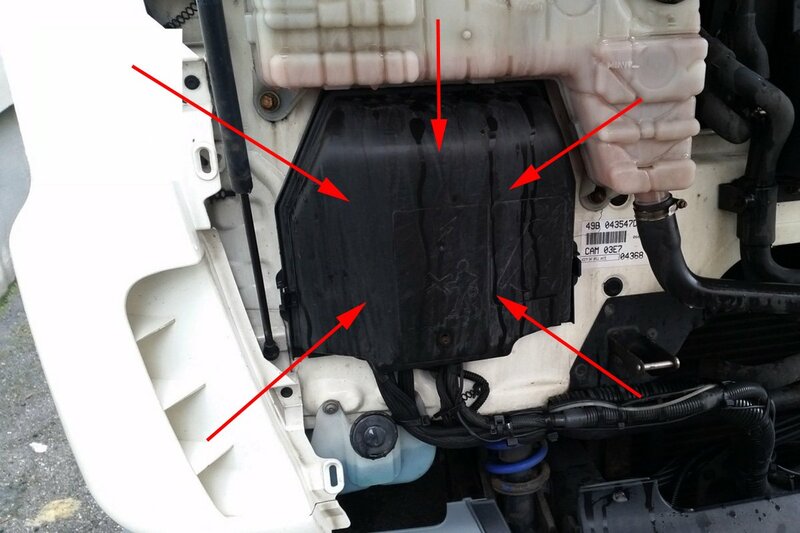 Please locate the junction box under the hood of your DAF LF truck (same for EURO 4 / EURO 5 and EURO 5 EEV versions). Locate this particular plug as shown and remove it (DAF LF EURO 4 / EURO 5 version). 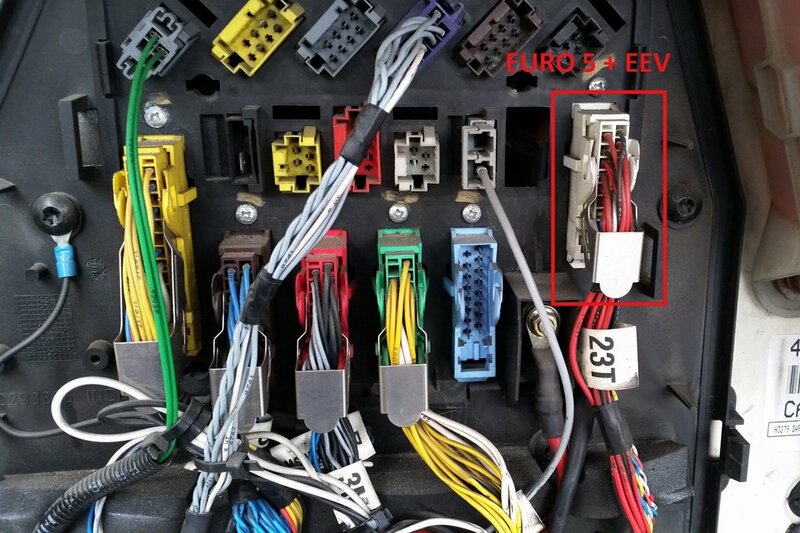 To connect AdBlue emulator we need to use these wires for CAN LOW, CAN HIGH and +30 connection (DAF LF EURO 4 / EURO 5 version). GND and other connections for AdBlue emulator (DAF LF EURO 4 / EURO 5 version). 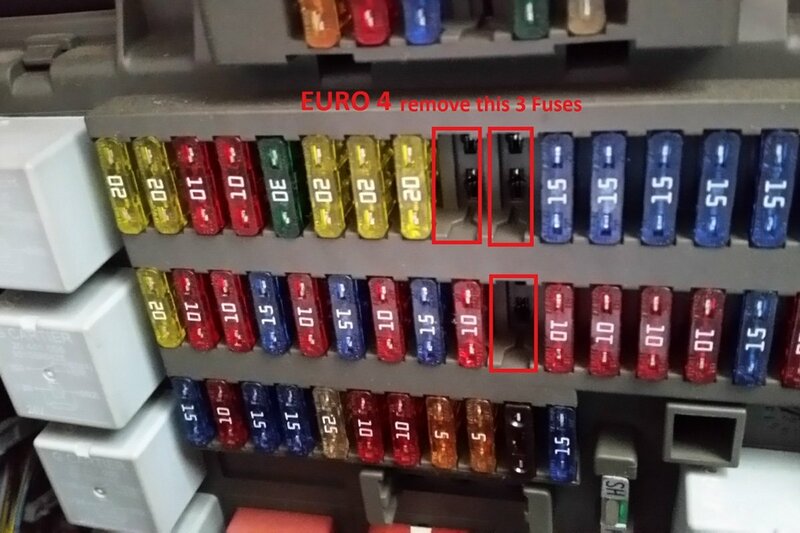 Please remove these fuses from the fuse box (DAF LF EURO 4 / EURO 5 version). 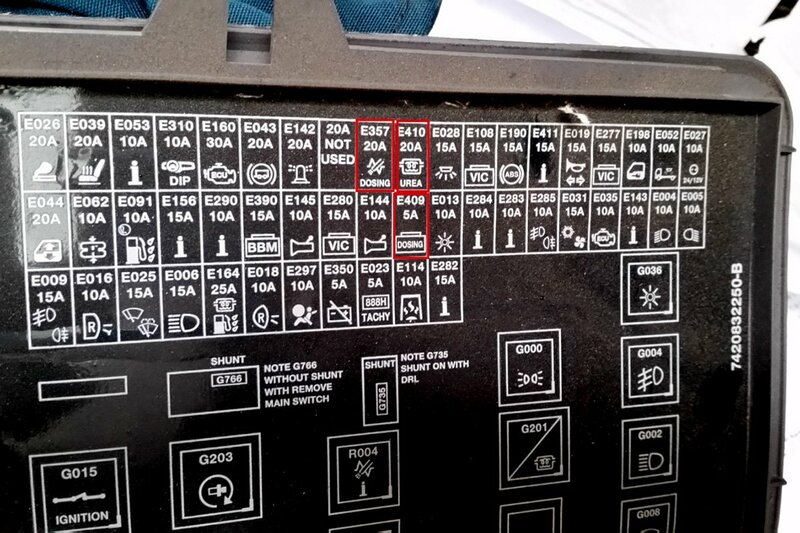 Check your fuse map to avoid any mistakes (DAF LF EURO 4 / EURO 5 version). 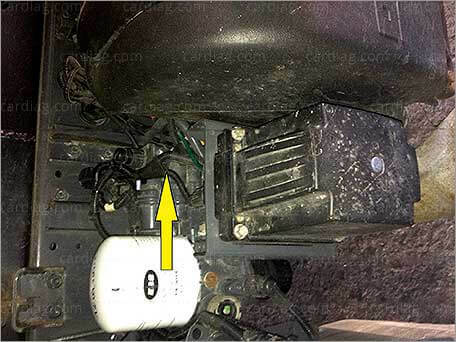 Locate this plug and use it to connect AdBlue emulator (DAF LF EURO 5 + EEV version). 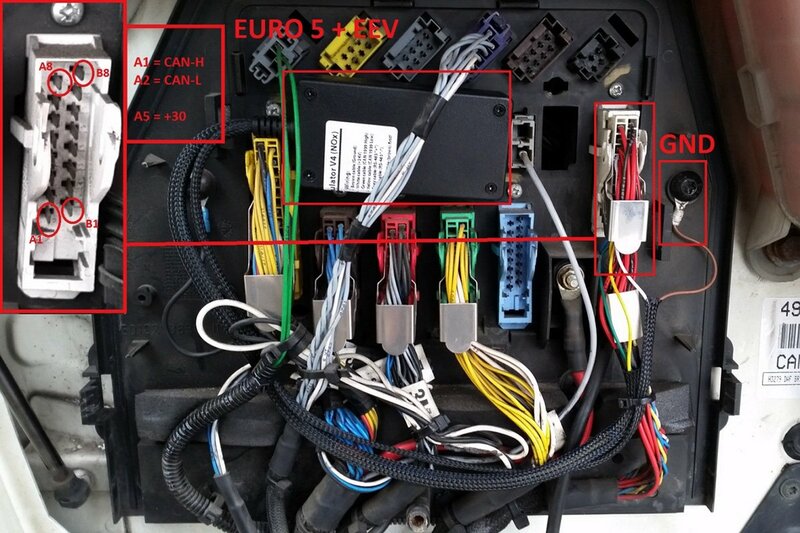 Connect AdBlue emulator CAN HIGH, CAN LOW and +30 wires to corresponding pins (DAF LF EURO 5 + EEV version). Check your fuse map to avoid any mistakes (DAF LF EURO 5 + EEV version). 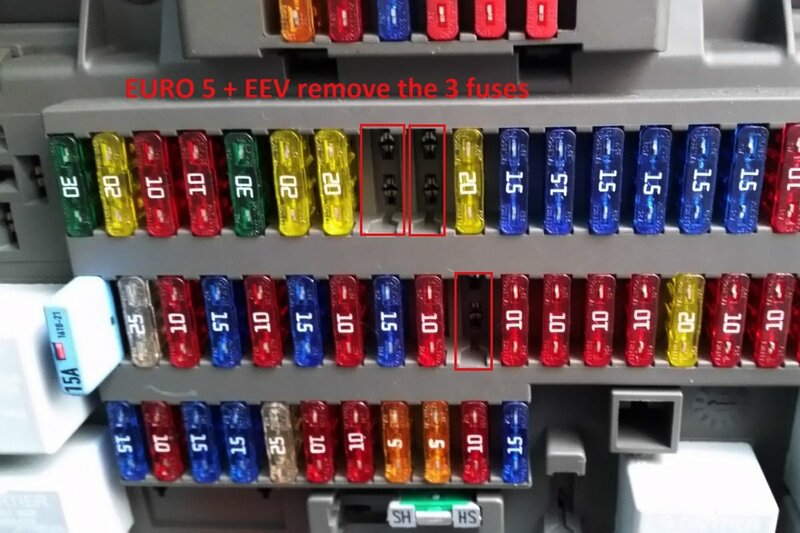 Remove these fuses from the fusebox (DAF LF EURO 5 + EEV version). If you notice any diagnostic faults on OBD system of your truck after installation of AdBlue emulator, than you need to make ECU reset to factory default settings by DAVIE DAF VCI 560 tool (recommended) or any other tool that is capable to reset ECU safely. 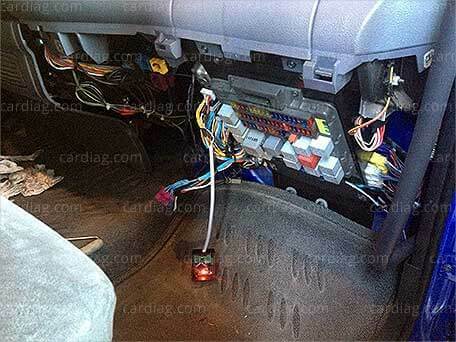 First of all locate fuse box in the cabin right on the passengers side. You should find wires marked as 3701C (blue), 3700C (yellow), 1198 (red) and white wire (next to red wire, without code number). 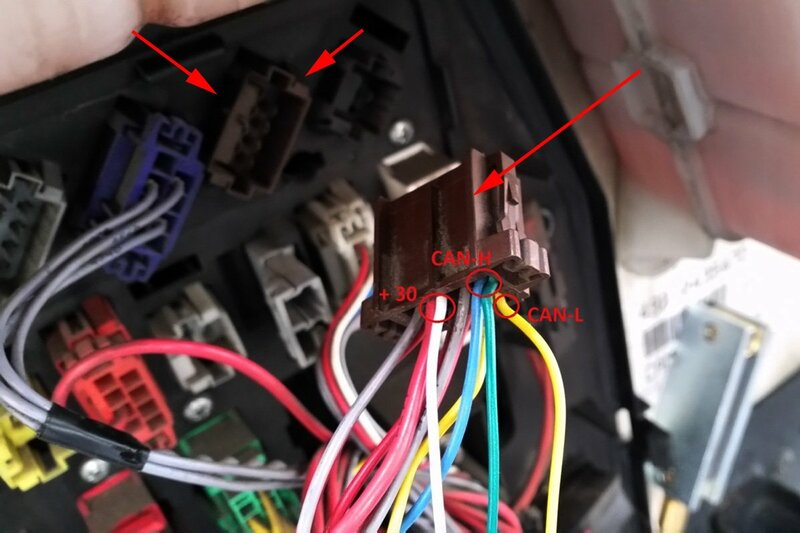 Usually these wires are located in the left side, upper corner of the fuse box. You’ll see grey plug (normally you should find there red wire (1198) and white wire (next to red wire) mentioned before. Third plug under the first one should have blue wire (3701C) and yellow wire (3700C). 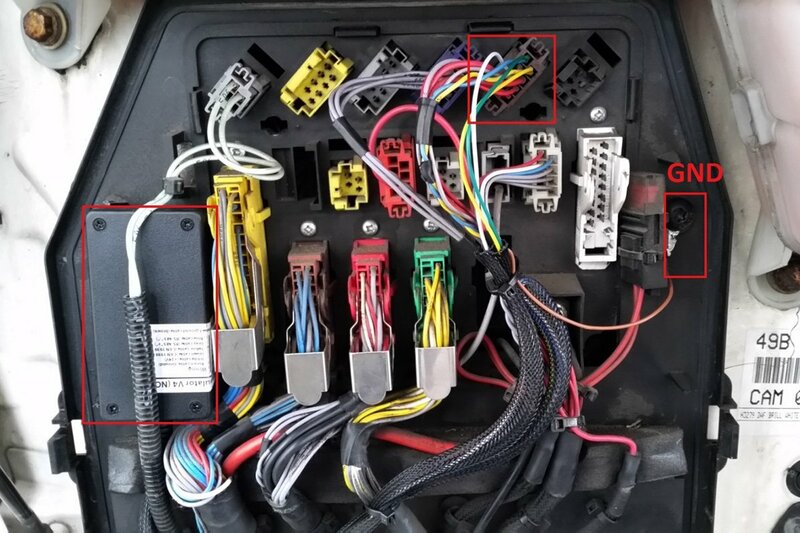 Each AdBlue Emulator V4 NOx has six wires, but for the proper connection on DAF LF (Grundfos) truck we need only four wires (AdBlue Emulator V4 NOx is universal and supports various trucks made by various manufacturers and extra wires that we will not use on DAF LF trucks are necessary only on other trucks). 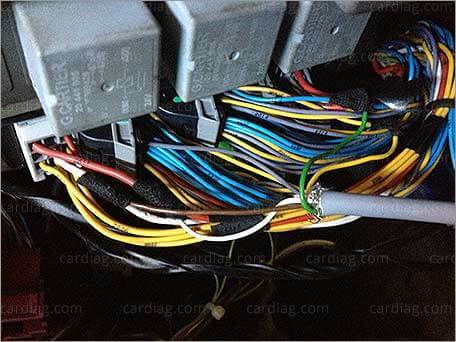 You must connect AdBlue Emulator V4 NOx emulator in such configuration (unused wires of emulator should be isolated). 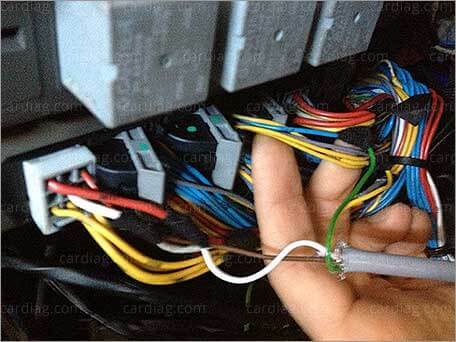 When you connect emulator to proper wires of the truck you need to disconnect NOx sensor and AdBlue sensor of the truck. Cut four wires of the NOx sensor and then cut eight wires of AdBlue sensor. 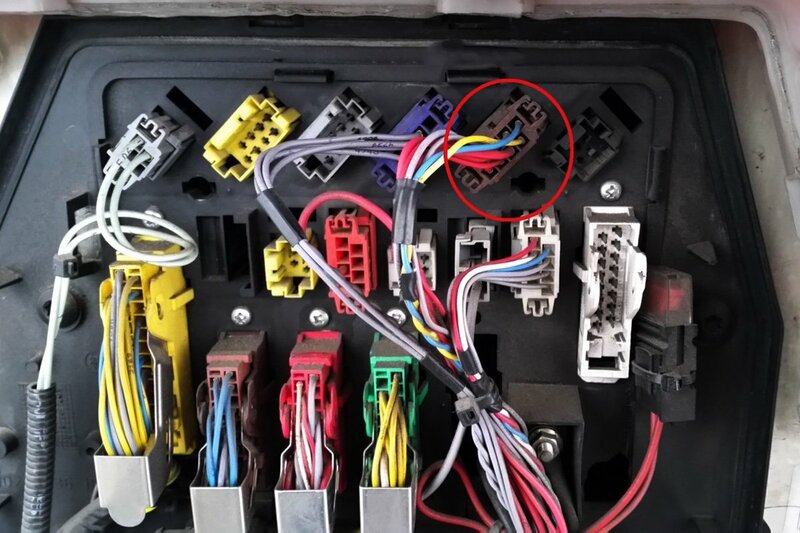 You can just disconnect power source of NOx sensor (pin 1 and pin 4), also you can just disconnect power of AdBlue dosing module (look for the yellow arrow on the image). When you do all steps described in this manual your DAF LF (Grundfos) should work normally without any additional exhaust smoke or engine power reduction. Please Keep in mind that you must purchase emulator preprogrammed for DAF LF, if it will be programmed for DAF XF it won’t work. If you have AdBlue Emulator V4 programmer device you can check AdBlue emulator program before installation (do not connect programmer to emulator while it is connected to the truck it can damage emulator, truck ECU and even itself). 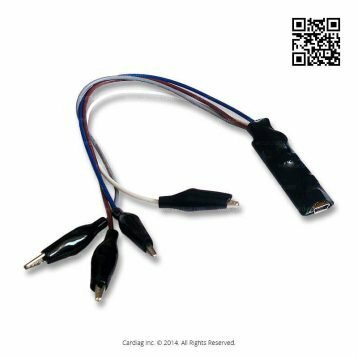 AdBlue Emulator V4 NOx installation manual for DAF LF (Grundfos) trucks was last modified: May 8th, 2017 by Cardiag Inc.